Welcome to Widnes Model Centre. We are a family run business which we started in April 2011 and as many of you may know our original shop was just across the road at 49-51 Widnes Road. 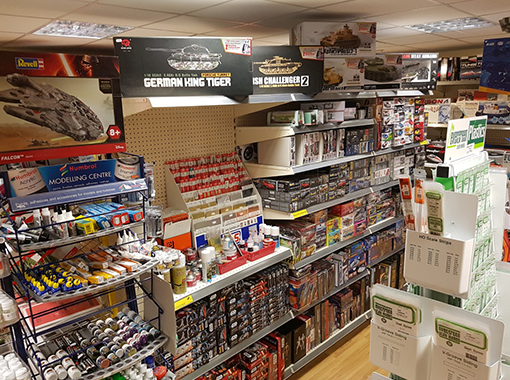 We moved into our new premises in June 2015 a much bigger and brighter environment housing a greater selection of models and modelling equipment. We are Barry and Gill Williams our son Tom the radio control and technical advisor and our adopted son and helper Peter who came as a customer when we initially opened. He began to help us in his spare time assisting customers with his technical knowledge and experience of running and racing RC cars planes and drones. Peter has a wealth of knowledge in electronics and he remains with us as a technical adviser after six and a half years. Widnes Models is an established HPI Radio Control Car Premier Dealer which means that we stock a selection of HPI cars and accessories but also we can ensure that customers and their cars are kept up to date with the maintenance of them. We provide HPI and other manufacturers, CML Distribution Tamya, FTX, and HoBao accessories and spares additionally offering repairs and servicing which are undertaken by trained HPI Technicians. In stock we have a selection of Drones, Aeroplanes, Boats and Tanks for the beginner to more experienced pilot and from a wide range of manufacturers. Amazing guys love coming to the shop feel so welcomed and got my 1:5 of scale k & n biggy yesterday and they looked me and sorted it all out and will never go anywhere else now and just want to say a big thank you to tom barry and gill to sorting it out all for me. Can’t thank these guys enough really looked after us yesterday my son got a nitro car for xmas and we could not get it running called these guys up after going to our local shop and being turned away they stayed open for us and sorted it out straight away great guys and whilst there purchased and electric car so both kids can play together will never go any where else again 5 stars not enough thanks again guys. Words alone cannot describe the friendly atmosphere of the place. The staff have always made me feel welcome and the staff are always happy to help, no matter how big or small the problem is, but the thing i most of all is their vast range of models to choose from. You cannot beat the widnes model centre.